Thumping music, flashy dancers, merry followers, and a decorated guy on a white horse. This is the Baraat or Indian groom procession. When I was told I'd be shooting a baraat, I honestly wasn't sure what to expect. But honestly, I wish they happened at EVERY wedding. Sometimes the wedding feels so much about the bride, that this was a nice balance. This was shot at Epping Forest Yacht Club with a horse from Pinto Carriages. An Indian groom arrives at the venue on a white horse, also called a Ghodi. This horse is flashily decorated by his relatives, usually with a saddle of velvet laced with gold trimming. An umbrella will also be planted on the horse to cover the groom. Why go for a horse when something bigger can do? An elephant is also a popular choice for grooms to tower tall above the procession, but it's hard to find an elephant in Jacksonville, lol! When a horse or an elephant is not available, an equally extravagant car serves the purpose, like a Rolls Royce. The groom sometimes rides together with a little boy relative. He wears a saafa, which is a turban tied on by his father. His sister attaches a sahra, which is a beaded veil to cover his face. Sikh grooms will carry a kirpan, which is a traditional dagger. Our groom and bride were Christians, but the bride's family was Indian, so they wanted the flavor of an Indian wedding with a Christian ceremony. The Baraat procession is a merry band of relatives, friends, and groomsmen. These are called Baaratis. It is not uncommon for strangers and passersby to be pulled into the procession, or join it for a few minutes of fun. The procession is led by one or several dhol (traditional Indian drum) players. Modern processions will have a DJ with a portable turntable, but a dhol player must be in the procession. They had a mobile DJ for this Jacksonville, Florida wedding and 3 colorful dancers to keep the beat going. It was great fun to see the groom get on the horse and the dancing to start. Then all the guests for the wedding followed in behind them to the ceremony location. Talk about a fun entrance! The Baraat is a noisy, merry event full of music and dance. There is the resounding beat of the dhol and other Indian instruments played by a live band. The people in the procession will sing along, and you can expect lots of dancing, twirling and head moves popular with Indian music. Modern processions feature DJs who will mix hip-hop and bhangra beats to the sound of the dhol. The groom’s procession is received by a band of horn players, called Shehnais, who play only at wedding events. Westerners seeing the Baraat for the first time will usually wonder, ‘where is the bride?’ But the Baraat is the groom’s moment in the limelight, to be adored in equal measure as the bride. The bride will be watching secretly, anticipating to receive her groom at the wedding site. 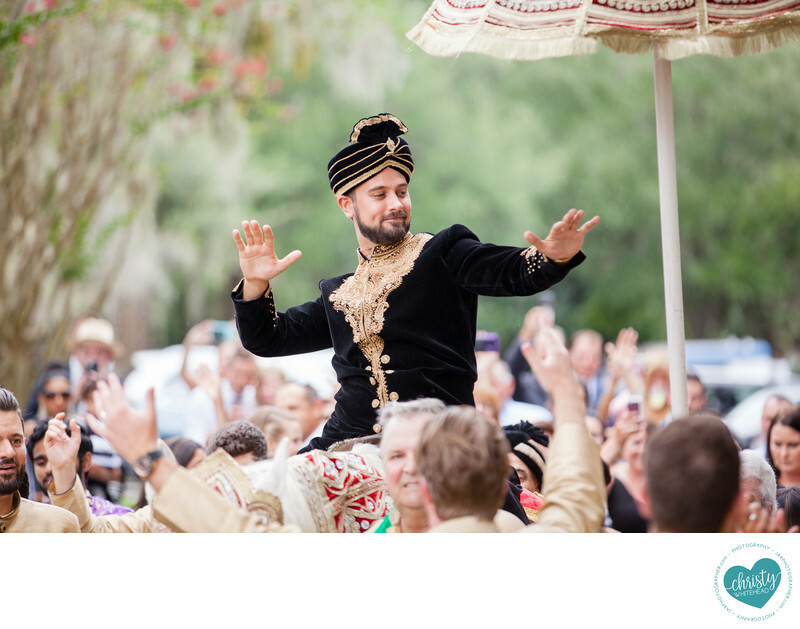 The Baraat is an awesome event for a photographer, setting a vibrant mood of the wedding day with lots of color, music, food, and fun. This event was planned by Southern Charm Events in Jacksonville. It was a huge party with lots of color and excitement, we had so much fun photographing it.